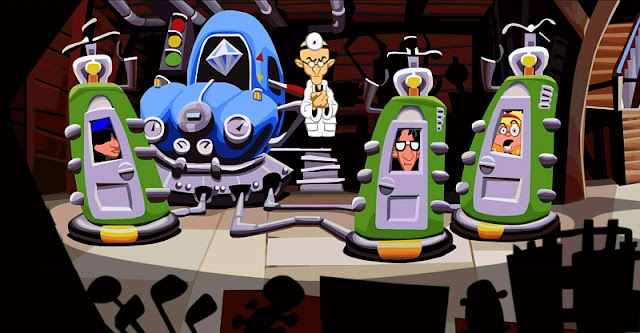 Indie Retro News: Day of the Tentacle Remastered - Classic Adventure overhaul is out now on GOG! Day of the Tentacle Remastered - Classic Adventure overhaul is out now on GOG! Somebody hold me as I'm in a state of shock! As after all this time of talking about it and getting our hopes up, the time has come to announce the release of ' Day of the Tentacle Remastered '. Yes that's right gamers, that famous Adventure game from the 1990's is now available to buy on GOG as an all new remastered edition. The sequel to the ground breaking Maniac Mansion in which three unlikely friends work together to prevent an evil mutated purple tentacle from taking over the world, with all new hand-drawn, high resolution artwork, remastered audio, music and sound effects! Day of the Tentacle was Tim Schafer’s ﬁrst game as co-project lead, and a much beloved cult classic! This special edition by Double Fine Productions has been lovingly restored and remade with the care and attention that can only come from involving the game's original creators. Commentary track with original creators: Tim Schafer, Dave Grossman, Larry Ahern, Peter Chan, Peter McConnell and Clint Bajakian. Game within a game: Includes full playable version of Maniac Mansion!